HAVING already covered the EPO‘s propaganda event a couple of days ago in Rijswijk, we can now move on to some rather interesting news. Union Syndicale Federale (USF) is deeply shocked to hear about the latest, disproportionate measures against trade union officials taken at the European Patent Office (EPO) in January 2016. 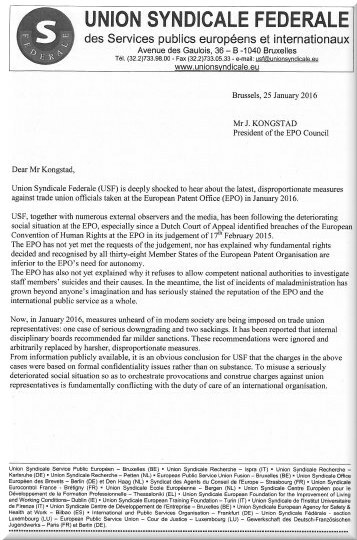 USF, together with numerous external observers and the media, has been following the deteriorating social situation at the EPO, especially since a Dutch Court of Appeal identified breaches of the European Convention of Human Rights at the EPO in its judgement of 17th February 2015. The EPO has not yet met the requests of the judgement, nor has explained why fundamental rights decided and recognised by all thirty-eight Member States of the European Patent Organisation are inferior to the EPO’s need for autonomy. The EPO has also not yet explained why it refuses to allow competent national authorities to investigate staff members’ suicides and their causes. In the meantime, the list of incidents of maladministration has grown beyond anyone’s imagination and has seriously stained the reputation of the EPO and the international public service as a whole. Now, in January 2016, measures unheard of in modern society are being imposed on trade union representatives: one case of serious downgrading and two sackings. It has been reported that internal disciplinary boards recommended far milder sanctions. These recommendations were ignored and arbitrarily replaced by harsher, disproportionate measures. From information publicly available, it is an obvious conclusion for USF that the charges in the above cases were based on formal confidentiality issues rather than on substance. To misuse a seriously deteriorated social situation so as to orchestrate provocations and construe charges against union representatives is fundamentally conflicting with the duty of care of an international organisation. Union Syndicate Service Public Europeen — Bruxelles (BE) • Union Syndicale Recherche — Ispra (IT) • Union Syndicale Recherche —Karlsruhe (DE) Union Syndicale Recherche — Petten (NL) ■ European Public Service Union Fusion — Bruxelles (BE) ■ Union Syndicale Office Europeen des Brevets — Berlin (DE) et Den Haag (NL) • Syndicat des Agents du Conseil de (‘Europe — Strasbourg (FR) ■ Union Syndicale Eurocontrol France – Bretigny (FR) • Union Syndicale Ecole Europeenne — Bergen (NL) ■ Union Syndicate Centre Europeen pour le Developpement de la Formation Professionnelle — Thessaloniki (EL) ■ Union Syndicale European Foundation for the Improvement of Living and Working Conditions— Dublin (1E) • Union Syndicale European Training Foundation — Turin (IT) ■ Union Syndicate de l’Institut Universitaire de Firenze (IT) • Union Syndicale Centre de Developpement de I’Entreprise — Bruxelles (BE) ■ Union Syndicale European Agency for Safety & Health at Work — Bilbao (ES) • International and Public Services Organisation — Frankfurt (DE) — Union Syndicate Federale – section Luxembourg (LU) — European Public Service Union — Cour de Justice — Luxembourg (LU) Gewerkschaft des Deutsch-Franzosischen Jugendwerks — Paris (FR) et Berlin (DE). USF urgently calls upon all EPO organs to annul the decisions taken against trade union representatives. UDF calls upon all EPO organs to return to the rule of law and sound practice as commonly understood in the 21st century and to take all necessary corrective steps at their next internal meetings in order to avoid further irreparable damage to the Office’s reputation, as well as to the social climate at the EPO.